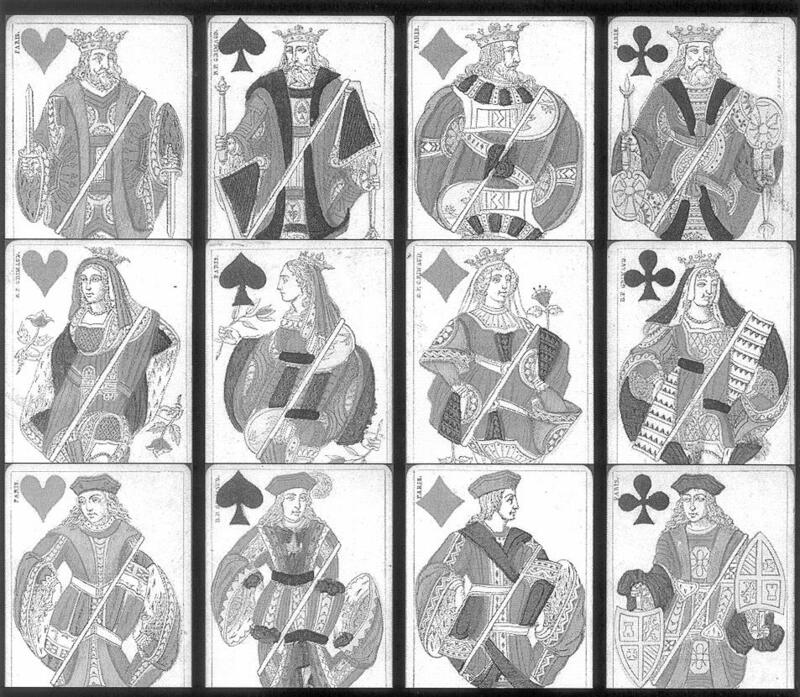 Until the abolition of the tax on playing-cards, French card makers were allowed to print from their own moulds only foreign or non-standard patterns, on paper without a watermark. The design of these tax exempted cards had to be clearly distinguishable from the portrait officiel and must not use the names Charles, Argine, Hogier etc. Under these conditions, several patterns were designed in France, different from the portrait officiel, yet at the same time showing a strong resemblance to it. J has a triangular shield instead of an oval escutcheon, and its design resembles the coat of arms of the former Spanish Netherlands. On most variants (except those from Belgium) the traditional names Charles etc. are replaced by the name of the maker. The dividing lines of the cards do not have circles with a central dot. Often green replaces the more usual blue of the portrait officiel. The main feature for classification is the shield of the J .
Grimaud’s product was used in Casinos, e.g. in Belgium and Spain, and it had an early and lasting success in the region of Genoa, replacing other patterns, e.g. the Sonet-Morin type. Around 1900 it conquered the Ottoman Empire, the Balkan states, and the Mediterranean from Algeria to Syria. In Belgium, card players were already using it in the 1890s, but it became the national pattern only after World War II. Besides the Anglo-American pattern it has become the most widely used pattern world-wide, although nowadays in a process of replacement by the former (e.g. in Greece, Bulgaria, Egypt). Because of its popular use in Genoa and Belgium, William B. Keller (at the suggestion of Sylvia Mann) called the pattern of the Grimaud/Badoureau pack the Belgian-Genoese pattern. This name should be used exclusively for the pattern described here as [IPCS #80]. Camoin type II: originally made by Camoin, Marseille, from about 1860. The differences are best recognized by comparing the illustrations below. Different compositions, according to the (local) games. Most European makers produced the Belgian-Genoese pattern, mostly as close copies of the original. Rather independent versions were produced e.g. by Amar et Fossorier, Paris (c.1900), Bony, Lunéville (c.1900), Bois, Lyon (c.1920), Dieudonné, Angers (c.1900), Armanino, Genoa (c.1900), Durà, Valencia (c.1930), Fournier, Vitoria (c.1920), Ilaskart, Istanbul (c.1990), Pulhan Matbaasi, Istanbul (c.1980). Haas: Das "belgisch-genuesische" Spielkartenbild, Freiburg/Schweiz 1997. Berry: Double-figure French pattern: early stages, JIPCS 13 (1984/85), pp.119 - 128. Depaulis: Essaie de généalogie du portrait de Paris, JIPCS 23 (1994), pp.62 - 74. Depaulis: Des coulisses à la scène: l’émergence des cartes à deux tâtes, Kontaktblad 17 (1989), pp.7 - 14. Depaulis: Le marché des cartes à jouer dans l'empire ottoman à la veille de la Première Guerre Mondiale, L'As de Trèfle 5 (2000), pp.4 - 5. Top three rows: Belgian-Genoese pattern, B. P. Grimaud, c.1860, design by Badoureau. Bottom row, from left to right: Sonet-Morin type, Camoin type I, Belgian-Genoese pattern, Camoin type II. Note: due to a lack of space the lower ends of all cards have been cut.